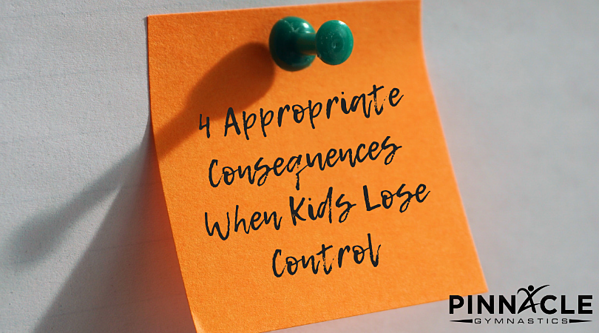 When our kids lose self control, it is so frustrating! The first thing to remember is not to lose our minds back at them. That will just reinforce those negative reactions and (depending on the age of your child) could lead to a finger pointing and accusatory battle. 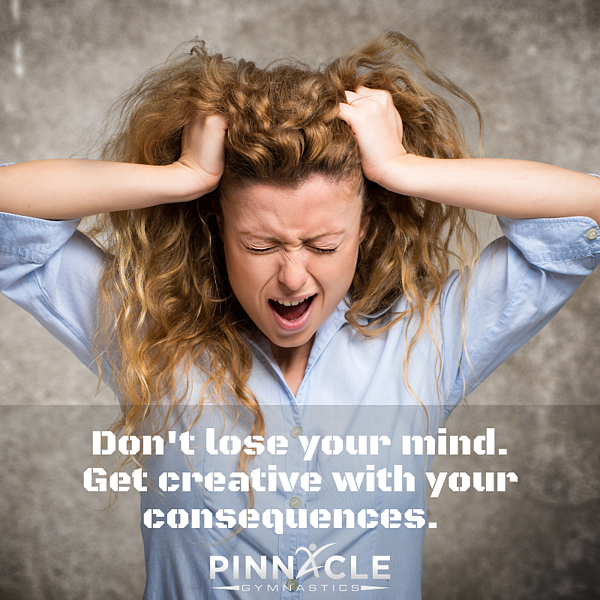 Instead, I like to get creative with consequences. One day last summer, my kids showed up at the gym after a morning with the summer nanny. When I asked how things went, the report started off benign, but ended with the fact that my oldest had hit my middle child with a wiffle bat - HARD. First, I am actually glad I wasn't there when it happened so that I was not tempted to lose my cool. To say I was shocked is an understatement. The mark on my son's leg only made me more furious. That, combined with the reason for the attack, "he kept calling my pitches inside". Talk about a bad day in the Kuchynka house. Now it was up to me to use this as a teaching moment. 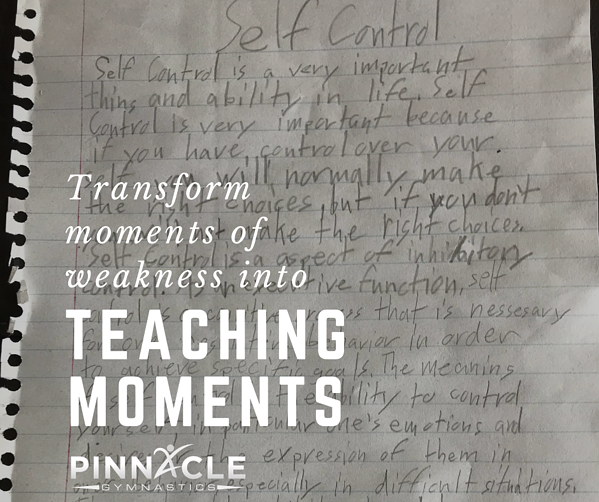 Here are a few of the things I used that day as well as some that I have used over the course of time to turn poor moments of displaying pillars of character into future moments of success. You could do this with any character trait (kindness, gratitude, etc). This report required research and coherent thoughts put into essay form. It also took time. I asked for it to be hand written in the nicest handwriting possible. Not going to lie, it turned out pretty great and even taught me a couple of things about neural pathways. Sometimes teaching kids that being alone is okay can help them control themselves when they feel like they are getting out of control. Age makes older kids smarter, bigger, and leads to different interests than younger siblings might have. When older kids (or younger kids) are getting frustrated by a sibling or friend, remind them of their list. Kids love stories. Have them ask you or another parent or family member about things you have done that display kindness or control when someone else is doing the opposite. Take it a step further and turn this into a list, report, or graph to show top ways to respond to difficult situations. Yes, to sleep. When kids are tired, their brains cease to function. Simple tasks become impossible and battles break out at lightning speed. Instead of engaging in a lose lose fight, put your child to bed. Whether it is for a nap or just an early bed time, the pay off will be worth it. I always add that "going to sleep will help you regain control" to help them understand how important a balanced life is. However, even if they fight it, sleep is sometimes the only way for children to regain control over their bodies and emotions. I think DMX must have been singing about kids when he wrote that song :) For real, parenting is hard and there is no guidebook on how to do it right or even to confirm you are on the right path. But, we can see real progress when we consistently reinforce and reward appropriate behaviors and use lapses in character as teaching moments. Hang in there! The days are long, but the years are oh so short.